This is handy if you find yourself needing to populate a numeric timestamp field (eight digit number, yyyymmdd) with the current date. Obviously, TheFile is the file you are populating, TheDate is the field and TheSelection is whatever selection criteria you happen to be using. Back in November, I mentioned that it was possible to extract the SQL source from existing queries using the RTVQMQRY command. I have since had an opportunity to play around with the IBM i Query Manager and have found it to be a surprisingly useful reporting tool. According to the iQuery Management Programming pdf, Query Management is the i5/OS implementation of query management Common Programming Interface (CPI). This allows you to retrieve data from a relational database and – most usefully – control the output formatting. It does this, unsurprisingly, by splitting the data extraction (the QM Query) and presentation (the QM form). Broadly speaking, there are two options you need to know about in order to use Query Manager. First there is the STRQM command which will lead you through the process of creating and maintaining Query Management queries and forms. And then there are the Query Management CL Commands, all of which can be found on menu CMDQM, and which allow you to work with and execute existing QM Queries. Inevitably, there are multiple ways of achieving the same result. What follows is what works for me but I do recommend that, if you do want to play around with this, investigate the available options to see what works best in your environment. The Default library for QM objects is initially set to *CURLIB. This is less than optimal, so I changed this to my own Development/Test library. Paging down, I also found the Default query creation mode. This is initially set to Prompted (which gives you a rather painful Query/400-like interface for creating queries). I changed this to SQL. There are a couple of options here. The first, and simplest, approach is to STRQM, take the Work with Query Manager queries option and then the Create option. This will give you an SEU screen into which you can enter your SQL (assuming, of course, your default query creation mode is set to SQL). The advantage of taking this approach is that this screen includes both a syntax checker and an option to execute the statement (either all, or a sample). So you can enter, validate and test your SQL, all from the same screen. If, however, you have an unshakable aversion to SEU, you can create and edit a source member using whatever tool or tools you prefer and then use the CRTQMQRY command to create your query. Once the query is created, your source member is no longer needed. Whichever way you do it, you will eventually end up with an object of type *QMQRY. This is your QM Query, an SQL select that can be executed with the STRQMQRY command. This is where things start to become interesting. The STRQMQRY command includes a Set variables (SETVAR) parameter which allows you to specify up to 50 variables to be set by query management before the query is run. That’s parameters in non-IBM speak. This is easier to explain with an example, so here’s an example using a couple of realy simple purchase order tables. The code for creating these tables and populating them with a couple of one-line orders is below the fold. And so, to the query. I have, a very simple QM Query (which I have imaginatively named QMTEST) that lists all orders in the simple orders database. This is fine, as far as it goes, but it’s unlikely that you will ever want a list of all orders ever entered. So here’s the same QM Query with a date selection added. There are a couple of gotchas to watch out for here. Because lower-case characters in variable names are changed to upper-case characters when passed to the command processing program, everything needs to be upper case. If you are passing a string (or date) surrounded by quotes, you need to use triple quotes. The ouer quotes are removed and the double quotes within the value are condensed to a single quote when the value is passed to the command processing program. No, it didn’t make much sense to me either. You can, of course, pass a variable rather than a constant value and as soon as you do this, it really does become useful. Now the fun begins. Having a parameterised, executable SQL object has its uses, but the QM form provides a presentation layer that allows you to format the output into something that’s almost pretty enough to put in front of your end users. You can edit a source member and then use the CRTQMFORM command to create your QM form, but the source is very sparse indeed. As such, I found that using the Work with Query Manager report forms option in STRQM to go through the prompts was quite useful. And then you’re done. QM Queries are not a universal solution, obviously, but I have seen cases where they can be useful – most notably in conjunction with a tool such as CoolSpools that will email the QM Query, as an Excel workbook, to whatever distribution list has asked for it. This started out as a really short blog post in which my only intention was to make a few notes to help me keep track of what I’m doing. As can sometimes happen, however, it grew into this monster that you have just ploughed your way through. Oddly enough, I have encountered a couple of situations in the past where I have needed to regenerate sequence numbers in a table. The approach I took at the time involved populating the field in question with a value generated from the Relative Record Number. This approach looks a lot neater, which is why I’m noting it here for future reference. Someone asked me today if I had an SQL function to convert a six digit number into an ISO date. I don’t because if you store dates in date fields then there is no need to convert the date back into a date. The with clause builds a temporary table of store numbers and nicely formatted opening dates. This converts the six digit date into an eight character string which is almost good enough to pass to the build in date function. The main select then splits the date into its component parts and then concatenates these (with a ‘-‘ separator) so that the date can handle it. And now you have a value on which normal date calculations can be performed. Of course, the better approach would be to replace these legacy tables in order to make this sort of manipulation unnecessary. This is more for my own benefit than for anyone else, but I can see this question cropping up a few more times over the next few months. The issue is that I have a table containing an ISO date and have to populate a legacy table in which the date is represented as a ten character string (YYYY-MM-DD). The digits function returns a fixed-length character-string representation of the absolute value of a number. then all you need to do is identify the bit of the string that you need to use. I use SQL a lot. Not only embedded within my RPG programs but also interactively to check and maintain data. The IBM i does provide a green-screen interactive SQL session but as soon as you start writing anything more than simple select and update statements, this becomes very cumbersome. The System i Navigator also provides an SQL tool which, while an improvement on the green screen session is still pretty basic. It is possible, of course, to write your SQL in a source code editor like Notepad++ and then paste it into the System i Navigator SQL tool. Obviously, though, this is not ideal so I was rather pleased to discover that there is a better approach. I heard about SQuirreL SQL earlier this week and, having finally gotten around to installing it, I have to say that I am very impressed. 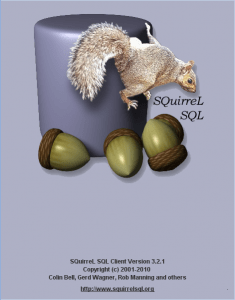 SQuirreL SQL is open-source SQL client that uses JDBC to connect to pretty much any database you can think of. It’s fast and feature-packed and really is a boon to developers. In order to get it up and running, you need to first download JTOpen, the open-source version of the IBM Toolbox for Java, and then download and install the SQuirreL Client itself. MC Press Online has a useful walk-through of the steps you need to take to get this all working. Once you’re in, though, it really is a lovely tool. I am not going to attempt to write a review on the basis of three hours of tinkering, but one thing that has struck me is that the keyboard shortcuts are well worth learning. Beyond that, I have yet to encounter a task that I can’t complete faster with SQuirreL than with my previous approach. We’re still on version 6.1 of the IBM i operating system at the moment, so I am making a note of this article for future reference because it looks very useful.